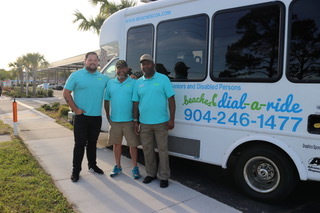 Last Thursday evening, Beaches Dial-a-Ride board and staff, business, civic and philanthropic leaders from the beaches community celebrated Dial-a-Ride’s service and vehicle expansion at Beach Diner in Atlantic Beach. 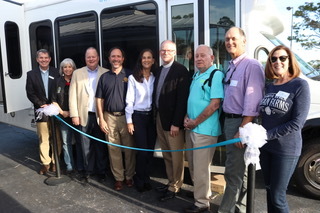 The newest para-transit vehicle in Dial-a-Ride’s fleet — a 27-foot, 2015 StarCraft AllStar, 13-passenger (10 regular seats; 3 wheelchair) bus— was revealed to nearly 60 guests at the private event, generously hosted by Barry Adeeb of Beach Diner. Beaches Dial-a-Ride drivers pose in front of newest para-transit vehicle in Dial-a-Ride’s fleet. Ribbon Cutting for Beaches Dial-a-Ride's new para-transit vehicle. (L to R) Gary Tiller, Executive Director, Beaches Council on Aging; Ellen Glasser, Mayor, City of Atlantic Beach; Charlie Latham, Mayor, City of Jacksonville Beach; Michael Bruce, Rotary Club of Ponte Vedra Beach; Vickie Cavey, President, Rotary Club of Ponte Vedra Beach; Rev. Keith Oglesby, Associate Rector, Christ Episcopal Church; Henry Burnett, President, Beaches Council on Aging; Bill Buckingham, Beaches Community Fund; Tracy Westbrook, Beaches Community Fund. See article about Dial-a-Ride’s expansion in Shorelines and Beaches Leader. Older PostDial-A-Ride's Joann Craft wins Luminary Award!